Advent is coming! And along with Advent comes our tradition at BSLC of collecting Christmas gifts for the less fortunate. For many years now, we have partnered with “Sally’s House”: a ministry of the Salvation Army. For nearly 20 years, Sally’s House has been the only emergency safe house in the Spokane area for children who are removed from their homes due to abuse, neglect, abandonment or criminal activity. These children, ages 2-12, are brought to Sally’s House either by the police or Child Protective Services when no other immediate foster care is available. They come scared, traumatized, and with only the clothes on their backs. The team of child-life specialists work to give each child a sense of security and hope as longer-term solutions are developed. They may stay at Sally’s for a few days, or up to 90 days. They often are transported to their own school to maintain a sense of normalcy. Many will hear Bible stories for the first time in the daily optional Bible lessons. They receive clothing, toys, nutritious meals, tutoring, life skills, and lots of play time while at Sally’s. Sally’s House has already alerted us to their most pressing needs this year: Legos, legos, and more legos! Also clothing for the older children (especially sizes 10 to adult); shoes for older children (adult sizes 2 to 10); and pajamas (especially sizes 8 through adult). The Caring Tree has sprouted in the corner of our fellowship room. 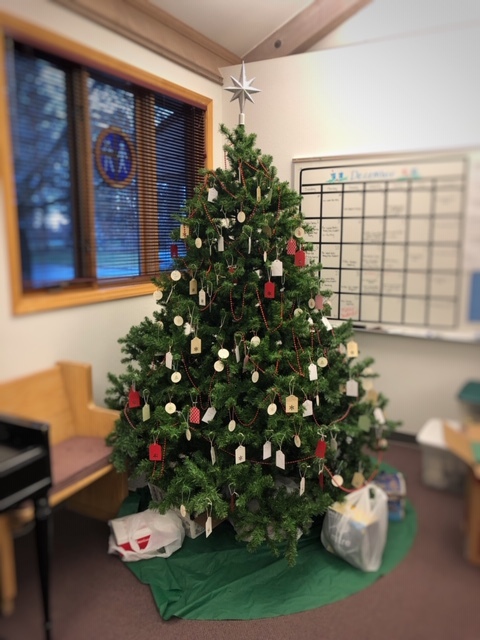 Gift suggestion tags will be available on the tree for “wish list” items. You are not limited to those ideas alone. If you wish, you may bring any gift suitable for a child. Please: no candy, gum, or toys of violence. Place any gifts under the tree before delivery date, December 23. DO NOT WRAP the gifts. Gift bags are welcomed. If you would like to help with gift delivery on December 23, or have other questions, call Connie Fisher at (509) 998-8079 or Maggie Fisher at (425) 999-6846.